THE urge to turn towpaths into cycle tracks as we all know is now well up on the agenda, with the latest being to widen the towpath through Edgbaston Tunnel on the Worcester & Birmingham Canal. Mind you, with councils and Sustrans breathing down its neck, one can hardly blame Cart, and it does get a bit of kudos for providing cycle tracks, just a pity that so many cyclists use them as racing tracks, making them so dangerous. However, back to the tunnel, that already has a towpath, but which Birmingham City Council want to widen to make into a cycle track. We have cruised through this tunnel many times over the last 20 odd years or so, but once again I'm perplexed by Cart's statistics of how many pedestrians and cyclists it states use it, it telling us that there are 600 pedestrians a day! Oh yes, plus 300 cyclists and not forgetting 25 boats. Which boils down to 'Cart at it again' promoting its incredible visitor numbers. It backs this figure with a counter that clocks usage of the towpath, that however, like its visitor numbers, is obviously a complete fantasy. Ask yourself—exactly 600 and exactly 300? I don't think so. And being able to differentiate between a pedestrian and a cyclists? If it had been say 134 pedestrian and say 86 cyclists, that would have been believable, but 600 and 300—no way José. Our first cruise down Tardebigge was in 2001 in early September with our log showing there were just five moving boats (that obviously used the tunnel) between Birmingham centre and Cadbury's where we stayed overnight. Certainly not 25. As to pedestrians, the only time we have seen any in a tunnel is in Newbold Tunnel on the Oxford, certainly not in the Edgbaston. But 600 a day through a tunnel plus 300 cyclists? 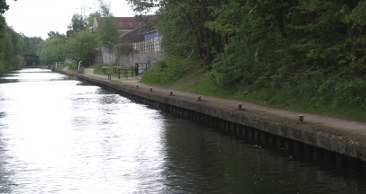 As many know, and as such as Nicholson's tells us, to be careful where mooring in Birmingham, so we were a bit dubious at staying on that pound especially as the mooring (pictured) was empty of boats, but seeing no one on the towpath, we risked it at Bridge 80, going into Selly Oak to shop, and in fact have used the Sainsbury's there many times with no problems—as the towpath is obviously not well used! The increase in cycle lanes in Birmingham is part of its council's Cycle Revolution of course, but any sensible person must realise that creating a fast cycle track through an 100 yards tunnel, when all too often most of the lights have failed—as we were told they were during December, would be very dangerous indeed. Of course some 'clever' person suggested a notice at each end of the tunnel telling cyclists to dismount, which leaves me to ask what is the point of widening the towpath in the first place if cyclists are to walk through? Anyway, we all know the value of notices to cyclists, the 'slow down' ones of Cart have had no effect whatsoever. With so few boats using the tunnel, I shouldn't imagine it will make any difference to boats, for with a clear sight of a 100 yards tunnel, boaters usually wait if one in coming the other way. The only trouble is will it be closed should the towpath widening take place? But it is a council scheme and with the shortage of cash, I don't think we should worry too much. The contributor Joseph Fords certainly started something when he brought up the subject of litter on the Leeds & Liverpool, but alas I can but agree with him that it is a problem on that particular waterway, but from experience it is normally only in the towns and cities. 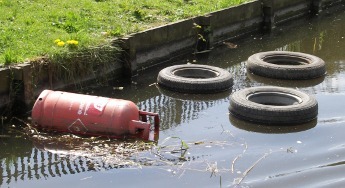 The picture of the tyres and gas bottle floating in the canal was taken in 2006, the second time we cruised, but alas it was indicative of the trend in the built-up areas of the waterway, that in many places is used as little more that a rubbish dump. As the number of shopping trollies and the like that are 'fished' out of the various waterways in towns and cities, well show. 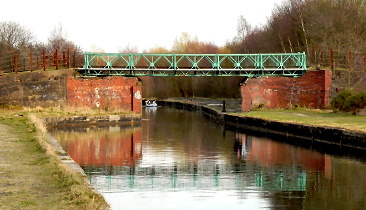 So Peel Holdings who own the Bridgewater Canal have decided to cut the time needed to do the repair to Vicars Hall Bridge from four months to three months. But even then the access to the Leeds & Liverpool being completely closed for that length of time to my mind is ridiculous. especially to repair a piffling single span bridge that surely could be lifted by a crane. Ahh, but Kier is the contractor—that was one year three months late in making a stretch of the M1 motorway hard shoulder into another lane... Even then, it could allow a few 'windows' for boats to pass, but alas, not Peel.